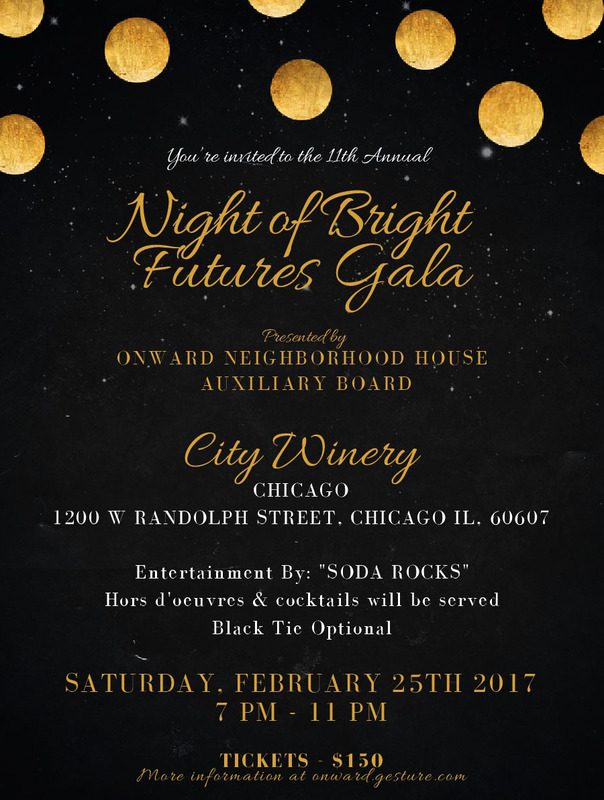 Please join us for our Annual Gala, Night of Bright Futures, presented by Onward Neighborhood House’s Auxiliary Board. The event will be held on Saturday, February 25 from 7 – 11 p.m. at City Winery, 1200 W. Randolph Street, Chicago. The evening will include entertainment by “Soda Rocks”, live and silent auction, raffle prizes, food and cocktails and much more! The proceeds from this event will benefit Onward House’s mission to assist families and individuals in need by providing access to a wide range of programs to create opportunities for long term success. We offer Early Childhood Education, a School Age Program, Family Support Services which includes a food pantry, a Community Computer Resource Center and an Adult Education Program. You may purchase your tickets by clicking here, the evening is black tie optional and be prepared to have fun! For sponsorship information please click HERE. For silent and live auction donation information please click HERE. Your support will directly benefit the children and families Onward House serves. For additional information please contact our offices at (773) 622-7723.